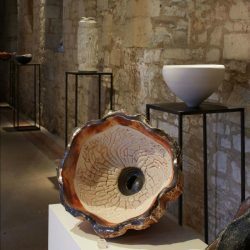 THE exhibition programme at Messums Wiltshire at the 700-year old Tisbury tithe barn includes an annual month-long celebration of clay and ceramics, Material Earth, this year running to 3rd March. For the first time, the Material Earth exhibition celebrates the vessel, in all its abstracted forms, showcasing new work by artists and makers from the UK, Japan, Canada, Israel and France. Clay, as the most elemental of all materials, has a history as old as human civilisation. In this new exhibition, Messums examines how contemporary artists are using this material in new and dynamic ways to create objects that go beyond a mere receptacle. 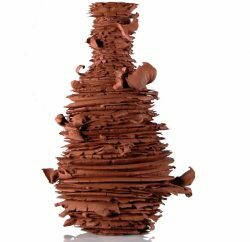 There is a strong emphasis on the use of the raw material to create non-utilitarian, twisted, morphed and often torn vessels, that are rich in meaning and metaphor. Amber Zuber, who graduated from the Royal College of Art in 2017, explores the tactile and emotional qualities of the material. By stretching, ripping, rolling and pushing the material to near collapse she finds new aesthetic qualities in her black and terracotta earthenware pieces. Thiébaut Chagué, who lives and works in a remote region of France, uses raw clay from near La Bourne, an area of gorges and rivers in the Rhone-Alpes region. At high temperature this clay acts temperamentally, as forms split and shapes sag. The artist disregards conventional ceramic technology, to create dramatic, fractured objects. Taizo Kuroda is one of the most important artists in Japanese contemporary ceramics. He is captivated by the beauty of the pure white porcelain of Joseon Dynasty Korea. His work includes bowls and stands of all sizes, and cylindrical or urn-shaped vases, but the works in the Messums show feature distinctive pieces with breaks in the surface, jagged apertures that emphasise the irregular lines of his vessels. Running concurrently to 3rd March in the Long Gallery is Paint – The Seen, The Unseen and The Imagined. Posted in Private View on 7 February, 2019 .